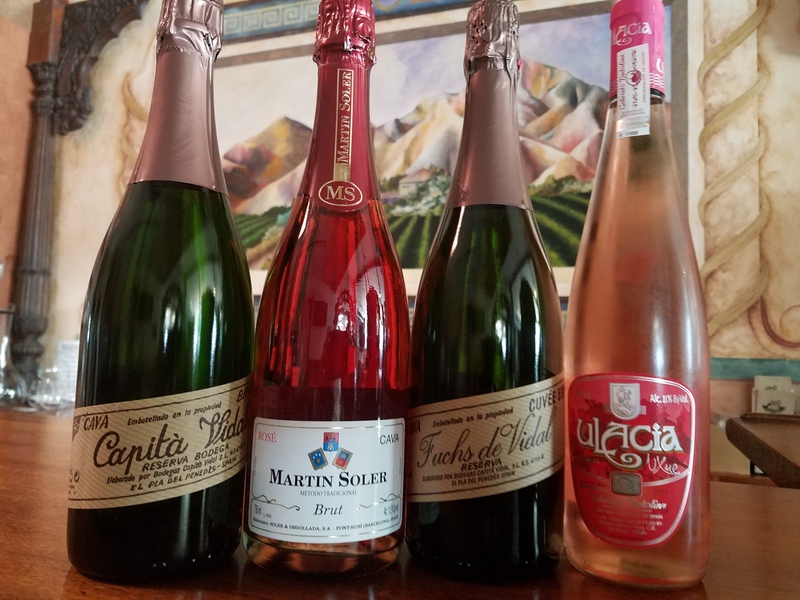 Cava – Spain’s sparkling wine made in the méthode champenoise but not as expensive! Last week I had the pleasure of meeting Kimberly Hocker of Cal Vin & Hocks, importer and distributor of small batch, boutique Spanish Cavas. Now, you might be familiar with cava from Spain, you might have seen some at the grocery stores. Usually you will see a cava called Freixenet being sold. It is one of the biggest sellers in the USA. The parent company of Freixenet produces close to 200 million bottles each year. Well, as you can imagine, with production so huge, the quality suffers and the true character of cava tends to dissipate. Kimberly’s mission is to bring small batch, artisanal cava made by some of the most acclaimed cava producers to America. I tasted through several of the cavas that Kimberly is importing and I was bowled over by the quality and the taste of the cavas. A quick primer on cava. Cava is a sparkling wine from the Penedes region which is located west of Barcelona. Cava is made in the same method as Champagne but they use different grapes. The three main grapes used to make cava are macabeu, parellada, and xarello. Other grapes that can be used are chardonnay, pinot noir, garnacha, and monastrell. Kimberly brought along cavas produced by Capita Vidal and Martin Soler. Capita Vidal was founded in 1985 by Captain Enrique Vidal – one of Spain’s best known sailors. Attention to detail and great care in the the wine making process is paramount to Capita Vidal. They hand pick the grapes and the bottles of cava are hand-riddled. Martin Soler can trace roots back to the early 17th century when the Soler family was growing grapes in that region. They started to produce and bottle their own estate wine and cava in 1965. The bodega takes great pride in the care they take to produce great cava. They also keep production small so that quality will not be compromised. Here are the notes on the three wines from Kimberly that we have in stock at The Bottle Shop. High quality wines at tremendous prices! You don’t need a champagne budget if you have champagne tastes….just get these outstanding values! Martin Soler Brut Rose 2011 $13.99 – Beautiful brightness to the red fruit, cherries, and pomegranate. This wine had a very pleasant bead that was refined and and elegant. Clean, pure, and refreshing on the finish. 100% Trepat grape. Cava Capita Vidal Reserva Brut Nature 2010 $13.99 – Composed of 30% xarello, 35% macabeu, and 35% parellada. This cava is clean and elegant with bright acidity. On the palate you get some toasty notes, dried herbs, and buttery bread. Aged 22 months with only 450 cases produced. Capita Vidal Fuchs de Vidal 2010 $15.99 – This cava is composed of 40% xarello, 35% macabeu, 25% parellada. Another crisp, vibrant, and bright wine. Wonderful complexity, very subtle yeast component along with slight almond notes. Clean and refreshing. This week’s tasting I included the Ulacia Txakolina Rosé 2016 to round out the Spanish theme…… this is not a cava but a wine made in the region Getariako Txakolina (Chock-oh-LEE-nah) from the hondarabbi zuri grape. This grape is not found anywhere else but in the Basque country of Spain. Ulacia Txakolina Rosé 2016 $19.99 – This is one of my favorite Rosés in the shop. This has loads of minerality with just a bit of salinity on the finish. It is mouthwatering, juicy and bright. You get watermelon, citrus, sour apple, and strawberry on the palate. It is a refreshing, bright, and slightly effervescent wine that will knock your socks off…that is if you’re wearing socks! Previous Rosé all day! Rosé all summer and everyday!